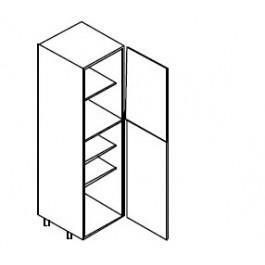 Larder Unit with 2 doors. Includes 1 fixed shelf and 3 adjustable shelves. The 1825mm height unit requires a top door 570mm high and a bottom door 1245mm high. The 1970mm height unit requires a top door 715mm high and a bottom door 1245mm. The 2150 unit requires a 895mm top door and 1245mm bottom door. All include BLUM Clip on Hinges and adjustable legs.